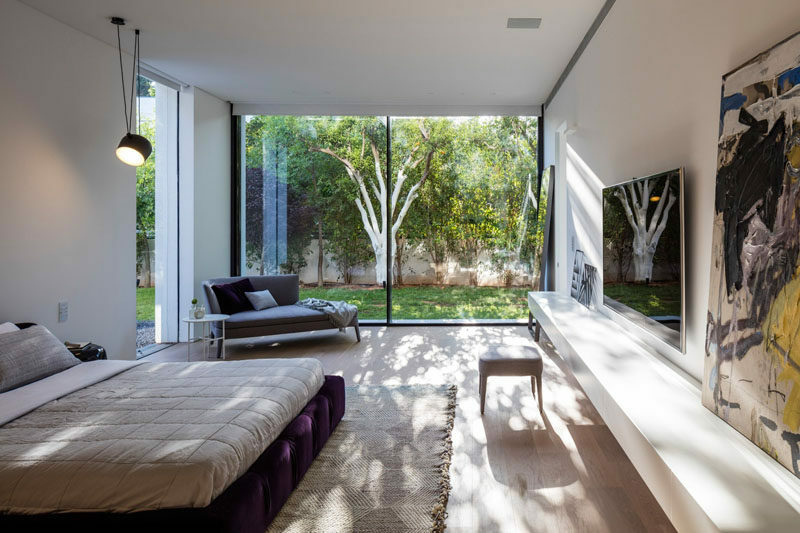 Pitsou Kedem Architects have designed a home in Savyon, Israel, that’s minimalist and transparent in its form and materials. 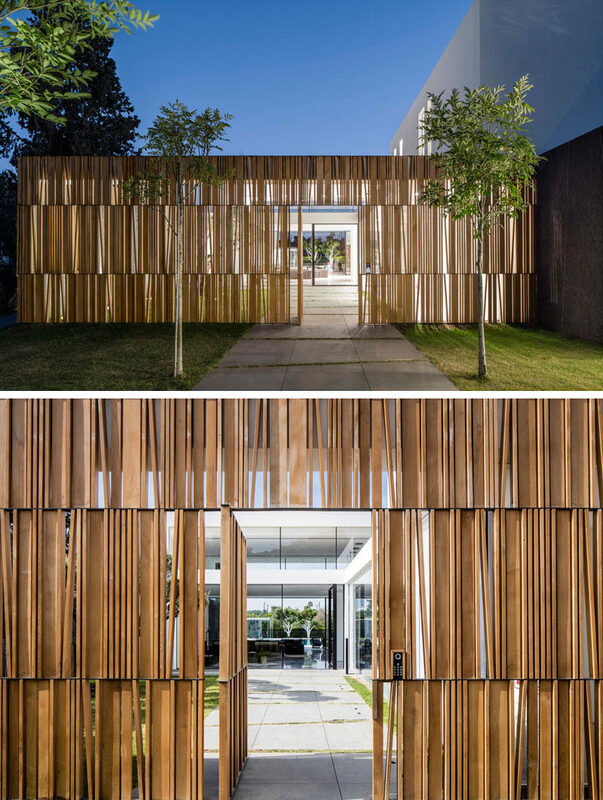 To enter the home, you walk down a tree lined path and through a wood wall that partially blocks the view to the inside of the home. 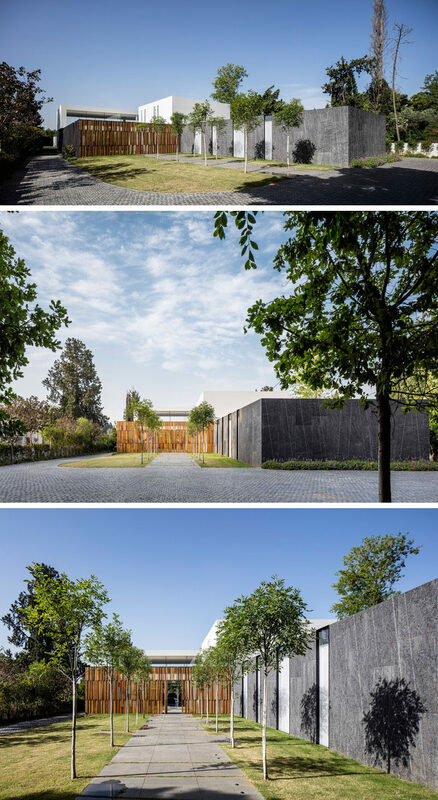 Upon entering through the wood wall, you’re greeted by a grassy courtyard with a single tree, and views of the interior of the home. 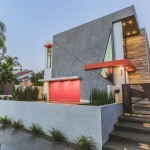 Through the large pivoting glass front door there’s a small sitting area. The living room, dining room and kitchen all share the same space that has a double-height ceiling and windows on either side. 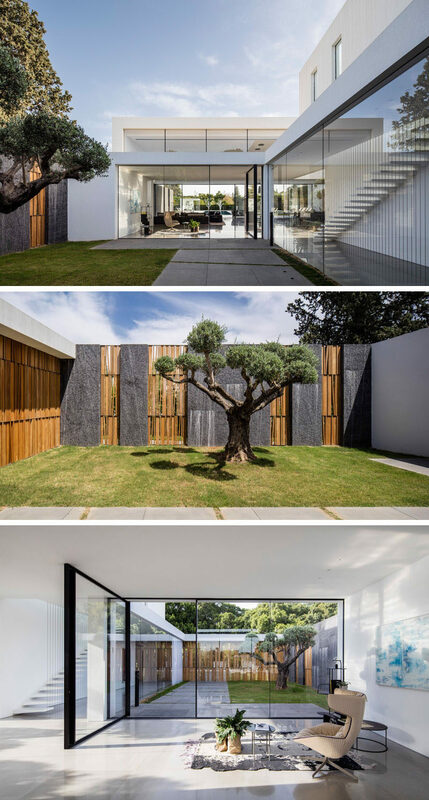 A large dark stone wall in the living area carries through to the outside of the home and the backyard. 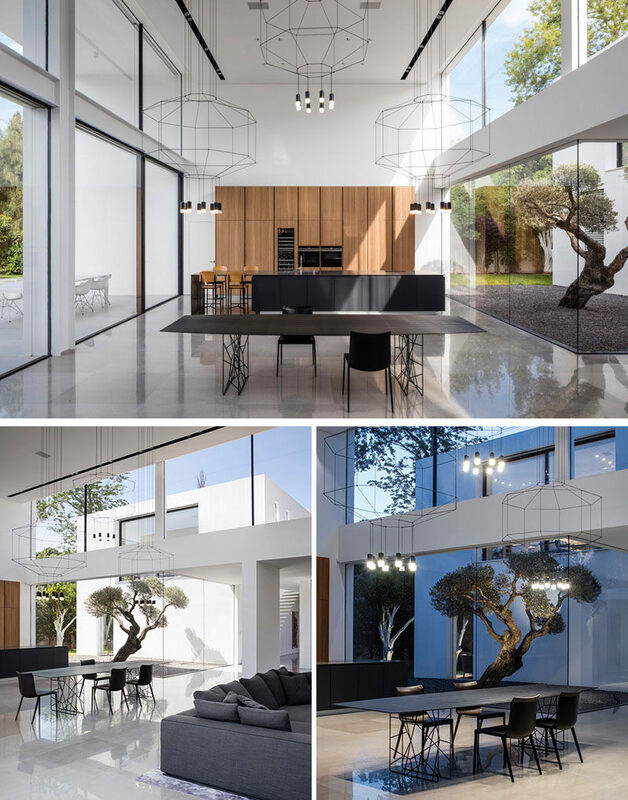 Large sculptural geometric pendant lamps highlight the dining table and help to anchor it in the large open plan room. 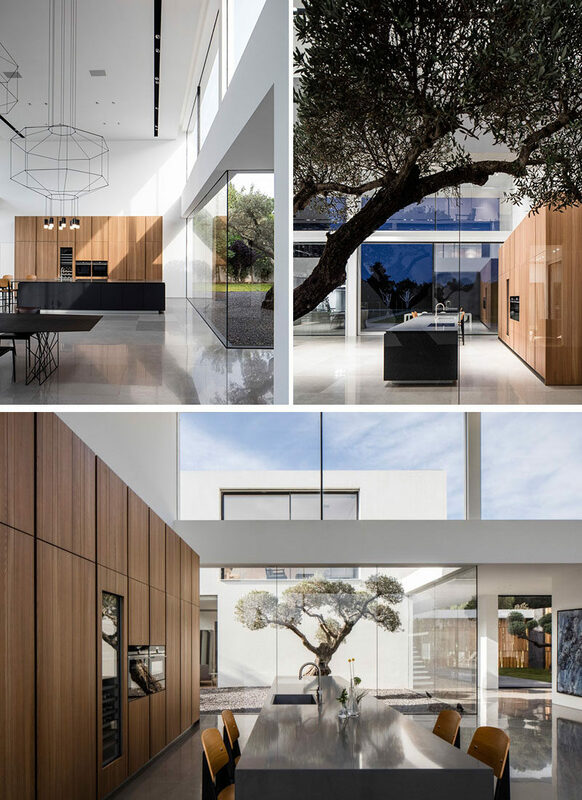 The kitchen, with a view of a tree in the courtyard outside, combines a black island and wood cabinetry positioned against the wall. 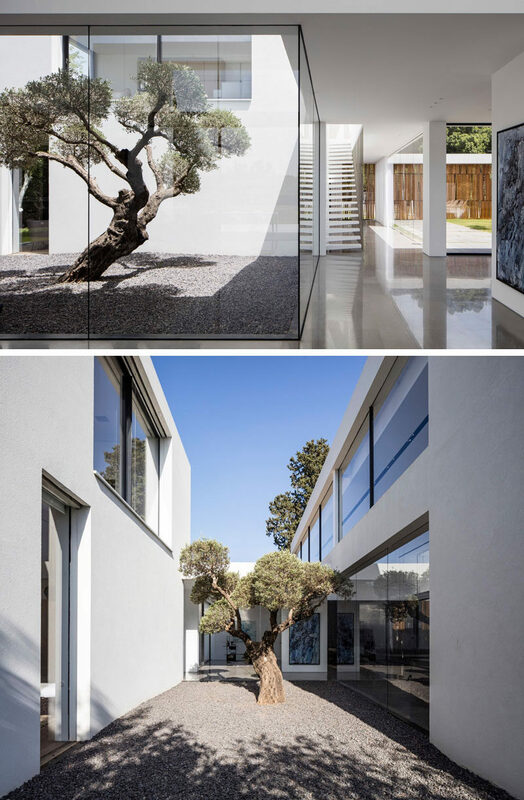 Next to the kitchen is a courtyard between two areas of the house that allows for a tree to become a piece of art. Off the main living area is the swimming pool and backyard. A patio area makes room for outdoor dining and lounging, while a covered gym area by the pool means that you can workout and then go for a swim. Back inside, here’s a look at one of the bedrooms that has a view of the garden through floor-to-ceiling windows. 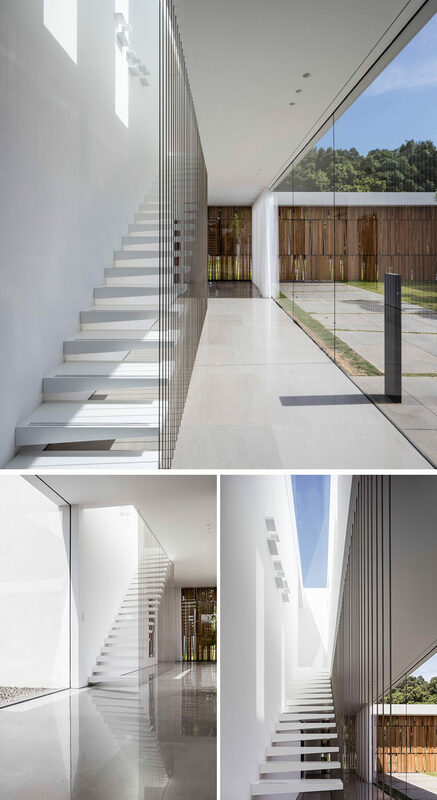 Back by the front entrance of the home, white stairs lit by a skylight lead you upstairs. Upstairs there’s another sitting area, this one looks over the courtyard.